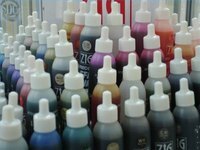 Alcohol ink is a popular type of ink for rubber stamping because a little is capable of going a long way. With the right recipe, you can easily make your own alcohol ink from home. Empty a package of Rit powered dye in your chosen color into a small empty jar of baby food. Fill the rest of the baby food jar with ordinary rubbing alcohol, seal the jar and shake it up well. Shaking the mixture up well is important because the results can be a bit grainy if you have not completely combined the powdered Rit dye with the rubbing alcohol. If you do not have baby food jars on hand, you can use black film canisters instead. For this recipe, you would fill the canister one quarter full with the powdered dye and the rest of the way full with the rubbing alcohol, once again making sure to shake the mixture up well. For a slightly less grainy mixture than the method above, start with liquid Rit fabric dye and isopropyl alcohol instead, mixing ½ cup of isopropyl alcohol to every two teaspoons of Rit dye. You may want to add more dye as necessary to create a deeper color, but keep in mind that a little definitely goes a long way. Mix the isopropyl alcohol and the liquid Rit fabric dye together and shake well, making sure that the two liquids mix completely before use. Once you have finished mixing either of the recipes listed above, you can apply the alcohol ink to your rubber stamps using an alcohol ink applicator or regular white cotton balls, rubbing the ink directly onto the stamp before stamping with it. It would be wise to test the stamp and ink out on scratch paper to make sure that you get a feel for how much alcohol ink you need before stamping on your final project. Keep in mind that a little truly does go a long way when it comes to alcohol inks, and you should always apply the ink to the stamp lightly to keep from over saturating the stamp or the paper that you are stamping on.